Which stationary phase should I chose for my peptide purification? Almost all the peptides I have synthesized were subsequently purified using a reversed-phase C18 column. Sometimes this worked, but sometimes it didn’t work so well. When my C18 purifications failed, I questioned whether or not I could have predicted this outcome prior to extensive HPLC efforts. Since then, I have learned that the amino acid composition of the peptide may give some clues to the peptide’s chromatographic behavior. While there are numerous stationary phase functionalizations for reversed-phase chromatography, in today’s post I will describe some differences I have observed when purifying peptides using C18 or C4 functionalized stationary phases for peptide purifications. Using a C4 stationary phase is typically considered when purifying either large (>40 amino acids) or very hydrophobic peptides. But what is very hydrophobic? And can a C4 stationary phase also be useful for purifying peptides that are more amphipathic in nature? I asked these questions while purifying three peptides that differ in length, amino acid content, and grand average of hydropathicity (Gravy). Gravy is a parameter calculated using the amino acid content and provides a gauge of a peptide’s overall hydrophobicity. Gravy values typically range from -2 (hydrophilic) to +2 (hydrophobic). I first started this evaluation with GLP-1, a 37 amino acid peptide synthesized using ChemMatrix® resin. This peptide is the longest of the peptides investigated, but also the most hydrophilic with a Gravy value of -0.614. The amphipathic nature of this peptide is well known, and the Gravy value near zero reaffirms this notion. 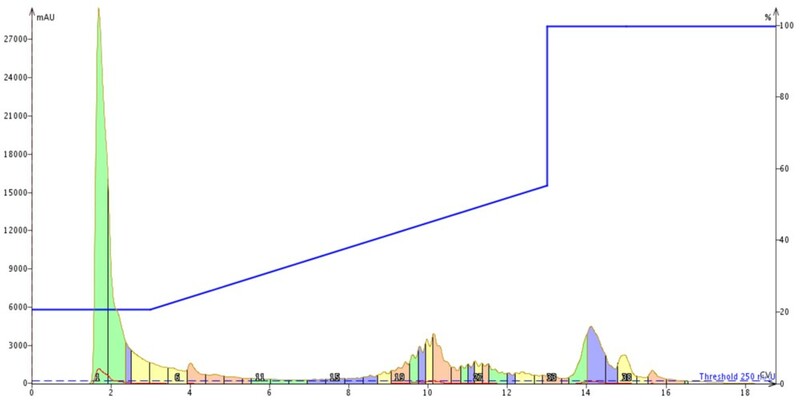 Using the approximate acetonitrile concentration for elution determined by analytical HPLC and some strategies for gradient optimization, I purified the crude peptide sample first using my standard Biotage® SNAP Bio C18 cartridge with an acetonitrile gradient running from 20% to 70%, Figure 1. Then, using the exact same gradient, I injected the same amount of crude GLP-1 onto my Biotage® SNAP Bio C4 cartridge, Figure 2. Figure 2: Crude GLP-1 purified using a 300Å C18 functionalized stationary phase. The peptide elutes at approximately 9 column volumes. Figure 2: Crude GLP-1 purified using a 300Å C4 functionalized stationary phase. The peptide elutes at approximately 8.5 column volumes. 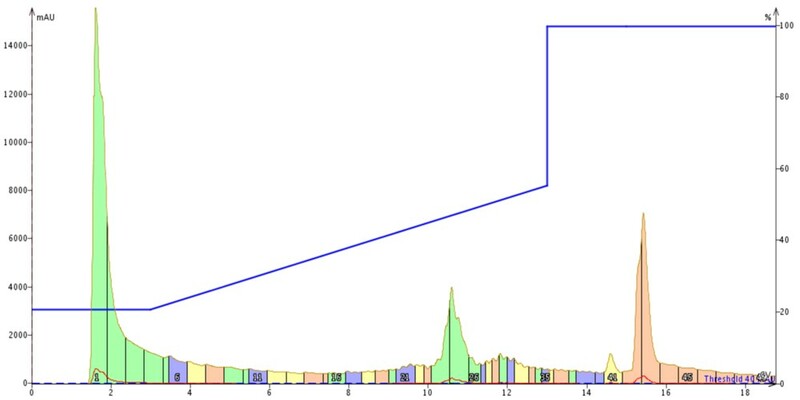 While this peptide is not particularly pure off the synthesizer (not unexpected as this synthesis protocol is not optimized), a major peak is identifiable in both chromatograms. The peptide elutes at a slightly lower concentration of acetonitrile when purified with the C4 cartridge. Interestingly though, the difference is less than one column volume. Despite the relative hydrophilicity, the peptide length appears to dominate the chromatographic behavior, thereby keeping the difference in acetonitrile concentration necessary for peptide elution small. Next I attempted to purify an 18-amino acid peptide known as 18A. This peptide is the most amphipathic of the three evaluated in this study with a Gravy value of -0.478. 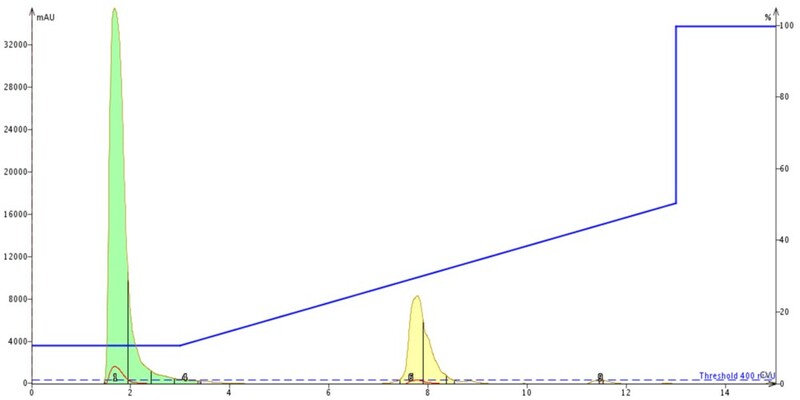 As done previously, a fraction of the crude sample was first injected onto a Biotage® SNAP Bio C18 cartridge and eluted with a linear gradient of 20% to 70% acetonitrile, Figure 3. Then, using the exact same gradient, I injected the same quantity of crude 18A onto my Biotage® SNAP Bio C4 cartridge for purification, Figure 4. Figure 3: Crude 18A purified using a C18 functionalized stationary phase. The peptide elutes at approximately 11 column volumes. Figure 4: Crude 18A purified using a C4 functionalized stationary phase. The peptide elutes at approximately 10 column volumes. As seen with GLP-1, the peptide elutes approximately one column volume earlier when purified using the C4 functionalized stationary phase than the C18 stationary phase. However, the difference in peak shape is striking. 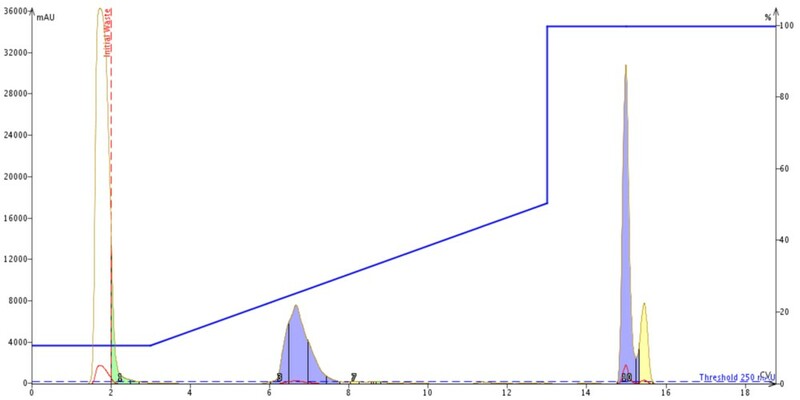 When purified using the C18 functionalized stationary phase, the peptide product peak is significantly sharper, clearly resolving a greater number of impurities than the broad peak observed with the C4 stationary phase purification. Finally I purified the fragment of acyl carrier protein (ACP) composed of residues 65-74. This peptide is considered difficult to synthesize, despite its short length and has a Gravy value of 0.460, making it the most hydrophobic peptides studied. For purification I chose a gradient starting at 10% MeCN and ending at 50% MeCN and injected equivalent volumes on both a Biotage® SNAP Bio C18 cartridge, Figure 5, and a Biotage® SNAP Bio C4 cartridge, Figure 6. Figure 5: Crude ACP purified using a C18 functionalized stationary phase. The peptide elutes at approximately 8 column volumes. Figure 6: Crude ACP purified using a C4 functionalized stationary phase. The peptide elutes at approximately 7 column volumes. This peptide is remarkably clean off the synthesizer, making purification relatively straightforward. Interestingly, the difference in retention is still only about one column volume. The short peptide length, combined with the relative hydrophobicity likely contributes most significantly to the reduced peptide retention by the C4 stationary phase. 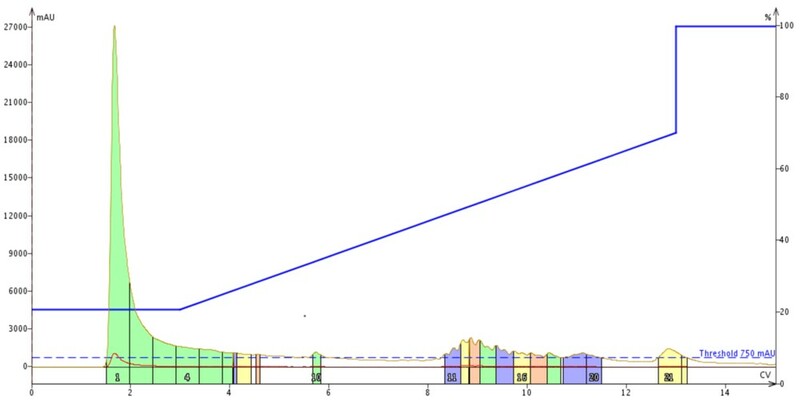 As with the 18A peptide though, the ACP product peak purified using C4 is also broadened. In this evaluation, three peptides differing not only in length, but also relative hydrophobicity were purified using a stationary phase functionalized with either C4 or C18 alkyl chains. As expected, all three peptides were retained less by the C4 functionalized material than the C18 functionalized material. 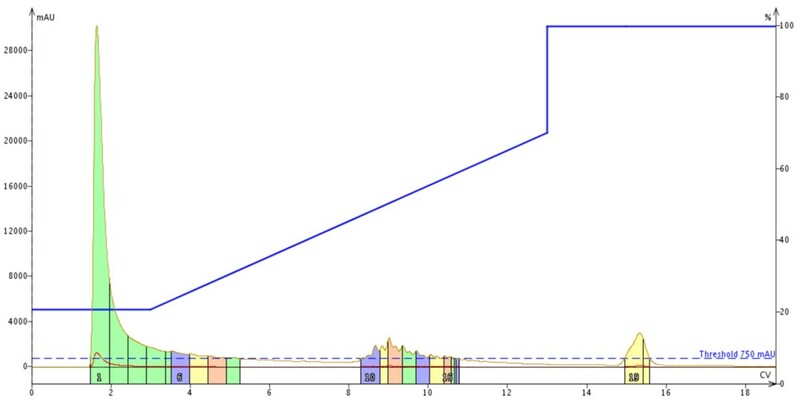 Unexpected though, was the significant peak broadening observed for the two shorter peptides. This observation can be supported by the partitioning dynamics required for purification using reversed-phase techniques. The short alkyl chains present less interaction surface, weakening the overall hydrophobic interaction strength. This increases the partitioning kinetics and results in peak broadening during the peptide elution. Although the differences were subtle for the peptides evaluated here, choosing an alternative stationary phase may allow for purifications not readily accessible using standard C18 functionalized stationary phase. Use the differences observed here as a guide for gradient selection in your future purification efforts. What is your favorite alternative stationary phase for reversed-phase peptide purification? Previous Previous post: Why won’t my peptide stick to my column? Next Next post: Green solvents for solid phase peptide synthesis?